Malik (Tahar Rahim) is a young Muslim man who finds himself facing a six year prison sentence for attacking policemen. Once inside, he comes to the attention of a group of Corsicans who, under the leadership of Cesar Luciani (Niels Arestrup), essentially run the prison. The Corsicans have learned that Reyab (Hichem Yacoubi) a witness against them is being held in another cell block. They can't get to him because the cell block he is in is predominantly Muslim, and a Corsican could never hope to get in there. But Malik? Well, he could get close enough to kill the witness, and if he doesn't they'll kill him. That sounds like it would provide enough conflict, tension and drama for an entire feature length film, but in actuality it only makes up the first half an hour or so of Jacques Audiard's brilliant prison drama. After the deed is done, Malik becomes one of the Corsicans, to an extent. He starts off making coffee and carrying messages for them, but gradually becomes a greater part of their organisation, learning how to run a criminal organisation as he goes along until he can start his own operation on the outside. Audiard's film is largely concerned with the logistics of things. Malik learns the ins and outs of a crime syndicate from his relationship with Luciani, but the film also focuses on the intricacies of smaller tasks, such as the processes involved in the production of jeans for retail or, in probably the most startling scene in the movie, the mechanics of murder. In order to kill his target, Malik must first seduce him and learn just the right moment to strike. Most importantly, he has to learn how to sneak a blade into a cell by hiding it in his mouth. In a scene that is so distressing that it has stuck with me since I first saw the film back in January, Malik stands in front of a mirror and repeatedly places a piece of jagged metal in his mouth. Each time he tries it, he fails and bloods drips out from the cuts in his cheeks, but he keeps trying and trying until he gets it right. It's a moment that is rendered all the more uncomfortable by the distanced way that Audiard shoots it. It's as if we are in the room, watching Malik mutilate himself but powerless to stop him. It's that concern with process that sets the film apart from the hundreds of prison dramas that it draws on for inspiration. In detailing the way in which a criminal is created over time (Malik may be in prison at the start of the film but there is little sense that he is a career criminal until the Corsicans turn him into one) A Prophet delineates perfectly the way in which exposure to hardened criminals can in turn alter the behaviour of men who are perhaps not beyond redemption. That's not the point of the film, I think that Audiard has a much more nuanced view of the lives of prisoners than that simple didactic would suggest, but that focus on details is one of the things about the film that makes it so enjoyable. At the centre of the film is a superb performance by Tahar Rahim, who brings a vulnerability and an icy coldness to Malik that is perfect for the role. It would be easy to play him as either an innocent who is corrupted by those around him or as an inveterate schemer playing everyone for his own ends, but Rahim plays Malik as a bit of both. Despite being unable to read or write, Malik is able to weight up all the angles and get what he wants out of a situation, but it doesn't always work out that way. Again, there is a sense that there is a process going on, and we really do see a change in Malik over the course of the film as he becomes better and better at manipulating his situation to suit his needs. Rahim plays him with a healthy degree of restraint, as befitting of someone who is acutely aware that they could get murdered any day, but through just his eyes he gives us a little glimpse at the mind furiously working away all the time. In stark contrast to the often tough and grim depiction of prison life is a metaphysical side to the film that is responsible for some of its most moving and provocative moments. After Malik kills Reyab near the beginning of the film, he is quite literally haunted by the act as the spirit of Reyab appears to him. Whether or not these are hallucinations brought on by Malik's guilty conscience or are actual visitations is never clear, but the interaction between the two is quietly sad and touching either way. What purpose they serve for the film as a whole is unclear, but they are beautiful moments in their own right. 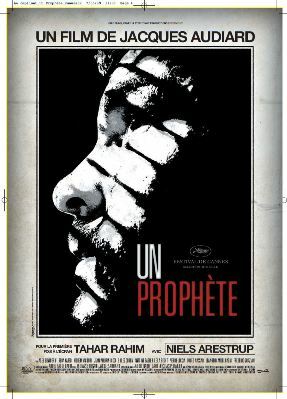 As a crime drama and as a film about the weight of guilt, A Prophet works brilliantly. What makes it truly great, though, and what has keeps me coming back to it, is that there are even more layers of subtext to it. Audiard comments on French society, religion, philosophy and creation myths, and each time I watch it I discover something new and fascinating about it. Much like its protagonist, it hides layers of depth beneath a deceptively simple facade, and I relish every opportunity to discover what more the film has to offer me.